With a brand new stadium, and a re-branding of the team, this was going to be a special night for the Miami Marlins regardless of the outcome of the game. But distracted by the grandeur of the ceremonious night, the Marlins could not pull their offense together and fell to the defending World Champion St. Louis Cardinals 4-1. Marlins reporters are focusing on the flamboyance of the evening, with regards to the Brazilian dancers who escorted the team onto the field, Muhammad Ali’s appearance, and the eyesore of the home run sculpture in centerfield. But this is the beginning of a new era of baseball in South Florida, and there were many more noteworthy occurrences on Wednesday night. Josh Johnson made his first start since last May, as he was sidelined for those 11 months with shoulder inflammation. His health is vital to Miami’s success this year as he is the ace of a deep rotation. On Opening Day last season, JJ took a no-hitter into the seventh inning against New York, and recorded a few other no-hit bids in April until he was DL-ed. Johnson was roughed up in the first inning last night, allowing two runs on three hits. After that he settled down, and displayed masterful control the entire night. He worked around the plate, but gave up 10 hits, just the second time in his career he has allowed so many in a game. Despite the hits off of Johnson, the Cardinals could not rally a big inning after the first. The Marlins defense smothered the ball and shut down any further opportunity for the Cards. With Jose Reyes leading Miami’s quick infield, double plays will be plentiful. But Hanley Ramirez and Reyes will have to adjust to their new roles as miscommunication was evident. In the top of the second, Carlos Beltran hit a soft ground ball between Ramirez at third, and Reyes at short. They both started running toward it and let up at the same time assuming the other would field it, as the ball rolled into left field. Fortunately, the miscue did not lead to a run, but the Dominican Duo is going to have to work out communication in order to prevent any further mistakes. Speaking of mistakes, I’m sure Jeffrey Loria is kicking himself for not making the right-center field fence about 10 feet shorter. In fact, the fences could use some moving in at every position. To dead center, the park is 418 feet, one of the longest in the game. Left field is a rather deep 340, especially with the relatively high fence. In the bottom of the 7th, Giancarlo Stanton drilled a fly ball to right-center field, but it was tracked down at the fence by John Jay, probably 400+ feet from the plate. That’s a home run at most major league ballparks, and if Stanton decides he likes hitting the gap in right-center, he has to make sure to hit line drives because there is a ton of running room for the outfielders to catch anything that hangs up. 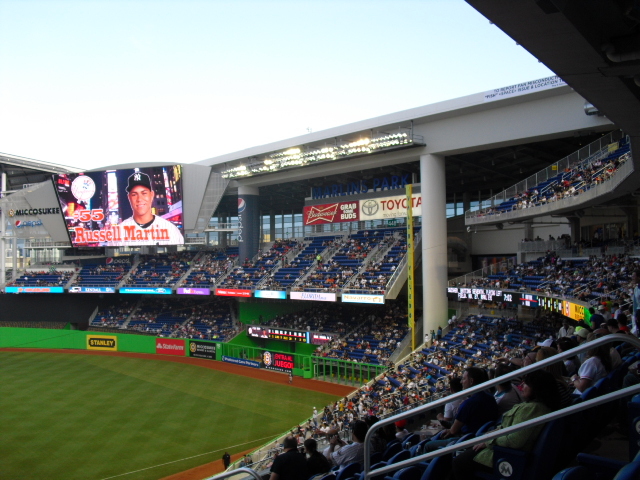 Marlins Park was officially unveiled on Wednesday night to a sellout crowd. So far, everybody seems to love the stadium, especially pitchers. Hopefully the Marlins can get it together in the next few days, and succeed in 2012.